[dorsolateral angle of pronotum parapsidal line tegula mesepisternum metepisternum axilla propodeum propodeal pit is not true, as careful examination shows; nevertheless the middle coxa, which in many bees is expanded upward to form a vertically elongated cylinder (see Michener, 1981b), displaces or is partly hidden beneath the lower part of the metepisternum. The form and subdivisions of the propodeum are important systematically. Many bees have a pair of impressed lines on the propodeum (dotted in Fig. 10-5b), beginning near its anterior dorsolateral parts and extending downward and posteromedially and nearly meeting in or above the propodeal pit, a median depression of the lower posterior surface. These lines, together with the anterior dorsal margin of the propodeum, enclose the propodeal triangle. Morphologically, this triangle is the metapostnotum (Brothers, 1976). The shape of the propodeum as seen in profile is quite independent of the triangle. The whole propodeum may be vertical or nearly so, dropping from the posterior margin of the metan-otum (Fig. 20-5a, c). In this case it is termed declivous. But there is frequently a more or less horizontal or sloping basal region (Fig. 20-5b), sometimes separated by a sharp line or carina from the declivous posterior surface, as shown in Figure 10-5a. The horizontal part is called the basal zone or basal area of the propodeum, sometimes called the enclosure when it is set off or enclosed by cari-nae; usually its sculpturing is distinctive, e.g., with striae radiating from its base. The basal area may be part of the propodeal triangle, or may extend beyond the triangle, at least laterally. Sometimes the basal area, as recognized by its sculpturing, is vertical like the rest of the posterior propodeal surface. The term "basal area" is applicable even if no sharp line separates it from the vertical surface and even if it is slanting or vertical rather than horizontal. 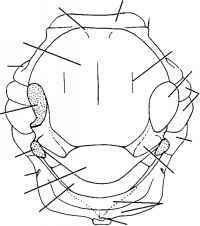 In some bees the two surfaces are continuously rounded, one onto the other in a broad, curving surface; in that case the term "basal area" is not definable unless there is distinctive surface sculpturing. In a few bees the triangle is reduced in size, its lateral margins meeting and continuing posteriorly as a single line (sometimes not recognizable) to the propodeal pit. In other cases (e.g., in some Xylocopa) the reduction seems to have continued until there is no triangle, but only a median longitudinal line extending to the pit. In other bees, when the triangle is not recognizable, it is because the lines that demarcate it are weak or absent. Figure 10-6. Diagram of the wings of a bee, showing the vein terminology of Michener (1944). 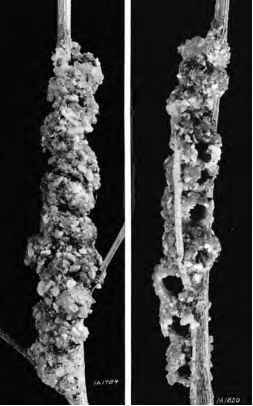 From Michener, McGin-ley, and Danforth, 1994.
beled, in Figure 10- 6, using a modified Comstock and Needham system. 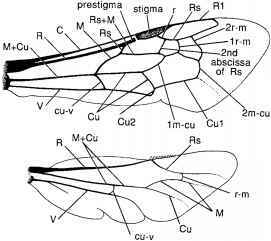 Wings are described as though spread, so that the direction toward the costal margin (where the stigma is in the forewing) is called anterior; toward the wing apex, distal. To save space, the word stigma is used in place of pterostigma. Because the homologies of the veins are not very certain, as well as because of some comparable-looking veins that often are referred to as a group, yet have very different morphological names, it has seemed best to continue the use of terms that are morphologically noncommittal for certain cells and veins much used in taxonomy. The names of cells and certain noncommittal names for veins are shown in Figure 10-7. Table 10-1 gives the equivalents, in Comstock-Needham terms, of these names. Of special importance are three veins that all look like crossveins: the second abscissa ofRs, first r-m, and second r-m, to use the Comstock and Needham system. These veins help to define the submarginal cells, which are usu ally either three or two in number. When there are only two submarginal cells, one sometimes does not know whether the missing vein is the second abscissa of Rs or the first r-m; both losses can apparently occur, and both result in two submarginal cells, as illustrated by Peters (1969). Hyleoides (Colletidae) (Sec. 47) illustrates the impossibility of knowing which vein is lost. Hylaeinae have two submarginal cells; in most genera the first is much longer than the second, suggesting that the first is really the fusion product of the first and second, but in Hyleoides the reverse seems to be true. Expression is greatly simplified by using similar terminology for all three veins. In the past they have been called first, second, and third transverse cubital veins. These veins, however, have nothing to do with the cubitus; in fact the cubitus is in a very different part of the wing. I prefer to call them first, second, and third submarginal crossveins (1st, 2nd, 3rd in Fig. 10-7). This terminology agrees approximately with that ofDiniz (1963), which was proposed for the same reason. Figure 10-7. 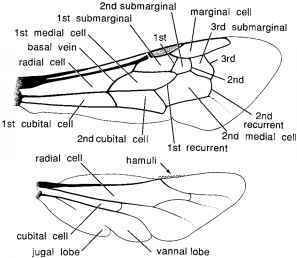 Diagram of the wings of a bee, showing the terminology of cells and morphologically noncommital terms for certain veins. (The notations 1st, 2nd, and 3rd refer to the submarginal crossveins.) From Michener, McGinley, and Dan-forth, 1994. Table 10-1. Morphologically Noncommittal Terms for Certain Forewing Cells and Veins and Their Equivalents in Comstock-Needham Terminology.